One of the best things thus far about my first year as a New Yorker transplanted to San Francisco is that I am in the city for the 2008 Slow Food Nation! If you don't know about the Slow Food USA movement or the global Slow Food International, but appreciate delicious food created with all the time and love necessary, then check out the websites above. Slow Food Nation is the first-ever US conference, workshops, events, exhibits, tastings, demos, discussions and extravaganza! I've got tickets to some of Saturday's festivities and will be sure to have camera and taste buds at the ready to share with my Scrumptious Readers. Stay tuned! I discovered a taste for Jicama a couple months back, after reading a terrific book I told you about on this blog. 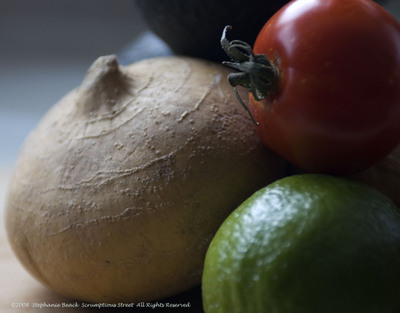 It's a staple of many Mexican and Latin American diets, and is terrific for its nutritional value as well as its culinary diversity. Jicama is one of those ingredients with almost no flavor but wonderful texture so it adds an interesting element to a dish. Its crunchiness reminds me of a starchy Granny Smith apple. But, it's as flavorless as something like a water chestnut yet vaguely sweet. So it will absorb whatever you give it for season and flavoring just beautifully. I created a salad that is a little bit like guacamole with crunchy "chips" included. 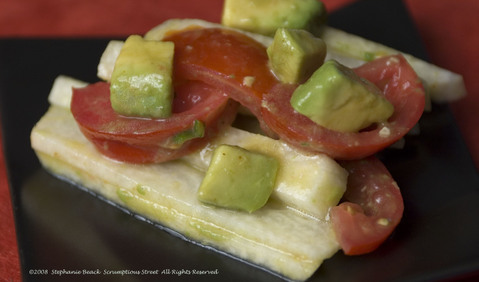 Take a look at my "Jicama and Avocado Salad". The recipe couldn't be easier, and the result is really fresh and satisfying. If you like guacamole or Mexican-influenced foods, you should give this salad a try. We had as a late summer meal with smoky barbecued chicken and it was a terrific combination. I only wish I had thought to make up a pitcher of margaritas as well! You can easily adjust and scale this recipe and let your taste buds be your guide in how much spiciness or tartness you want in the dressing. The photo below shows a whole jicama before peeling in case you've never seen one. It's the root on the left side of the shot. Peel it just like you would a potato. If it's not super firm and fresh, after peeling and slicing place it in an ice water bath for 10 minutes before preparing the salad. 1. Peel and slice the jicama and let stand in an ice water bath for 10 minutes. Drain all water and place in a large bowl. 2. Add the avocado and tomato to the bowl of jicama. Squeeze 1 tsp. of lime juice over the avocado pieces to keep them from turning brown. Toss gently. 3. In a second bowl, prepare the dressing by adding the jalapeno pepper and the remainder of juice from the lime. Add the chili powder and salt and whisk vigorously. Slowly drizzle in the olive oil, one tablespoon at a time, whisking briskly and continuously, until the dressing is thickened. Pour the dressing over the salad and toss gently. Serve immediately and enjoy this scrumptious summer salad! Again and again, simplicity and excellent ingredients win the day here at Scrumptious Street. The other day I was thinking about how much I love the delicately delicious combination of strawberries and champagne. Rushed for time and having none of that beautiful wine on hand, I found a way to feed the craving and my hunger all at once. 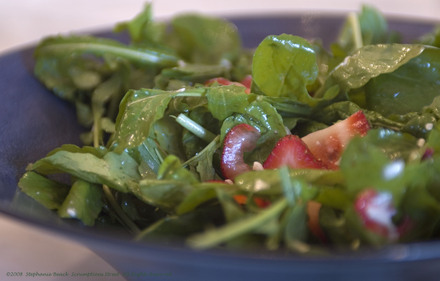 Here is a look at the resulting "Arugula and Strawberry Salad with Champagne Vinaigrette." One of the best things about being able to imagine flavors and how things will taste is the excitement I feel beforehand knowing something is going to work. This salad is really very special, quite scrumptious and spectacularly easy. 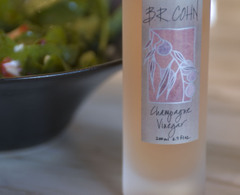 If you've never used champagne vinegar before, my favorite thing about it is that it's so softly tart, so delicately oriented toward sour that it provides necessary acidity to a dressing without demanding a lot of oil to balance out the flavor. It's perfect with strawberries, because you can discern that soft bubbly flavor and the sweetness of the berries respond as much with the dressing as when you're drinking a glass of bubbly and you drop in a berry. I chose arugula for the foundation of the salad, knowing a good peppery bite would be great with the soft-tart-sweetness. I picked a soft and creamy havarti cheese (plain, not dill or herb-spiked) to sprinkle in a little richness without dominating the salad. Havarti is very mild and almost as soft as brie but with more structure, so it was the perfect cheese to use here. As for the vinegar, there are a large number of exquisite brands out there, I just happened to choose this one since it was labeled as a Sonoma County Harvest Fair Gold Medal Winner. I hadn't tried it before but assumed this award meant it would be fantastic. Indeed it was! 1. Wash, drain and prep vegetables and fruit. 2. In a small bowl, add the scallion, champagne vinegar, salt and white pepper. Stir together and let sit a few minutes so the vinegar starts to soften and break down the scallion. Slowly drizzle in the extra virgin olive oil while whisking, to thicken and emulsify the vinaigrette. 3. In a medium bowl add the arugula, strawberries, cheese and fresh mint. Drizzle vinaigrette dressing over the top and toss very gently with your hands. 4. Serve immediately, especially good when served on chilled plates. Savor every bite! Summer in San Francisco is a new experience for me with its cold temperatures and frequent fog during the months of June through August. I can't say that I'm enjoying it that much, and have been spending a lot of time hunting sunnier climes. Typically one of my favorite summer drinks is the classic Dark and Stormy. It's best after a really hot day spent frolicking outside. I decided to create my own variation of the cocktail in honor of the Fog of the Bay Area this time of year, since it's not actually hot outside. And, the color of the drink is just subtly yellow-gold enough that it reminds me of a foggy sunset on the coast. Here's my "Summer Fog Cocktail". 3. 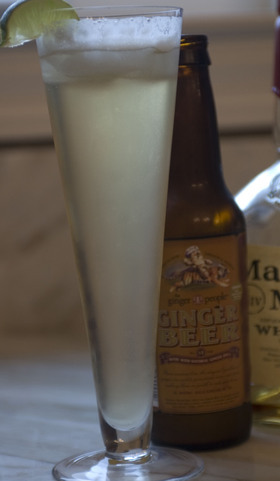 Slowly pour the ginger beer into the glass, increasing speed as you pour to create a nice frothy head on the cocktail. 4. Garnish with a wedge of lime and enjoy immediately! Remember, Ginger Beer is a non-alcoholic soda which is stronger than ginger ale. Try several brands and in my opinion the stronger it's flavored of ginger, the better. If you want a Dark and Stormy, use dark Rum instead of whiskey.